Liverpool travel to the St Mary’s stadium for a Premier League clash on Sunday. LIVERPOOL MANAGER JURGEN Klopp suspects that the reception for Virgil Van Dijk ‘will not be the most friendly,’ when they travel to face Southampton on Sunday. The Dutch international signed for the Merseyside club in December after two-and-a-half seasons with Southampton, in which he scored four goals in 67 Premier League appearances. It was a new world record fee for a defender, which was estimated at £75 million. Liverpool’s long held interest in pursuing Van Dijk was well known prior to the transfer, and it was also reported that he was a target signing for Chelsea and Manchester City. 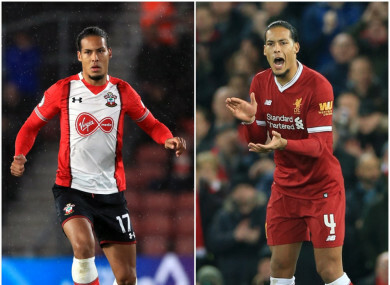 Van Dijk will be returning to Southampton for the first time this Sunday, when the sides meet at St Mary’s in the Premier League, and Klopp fears that the atmosphere might not be all that welcoming for the 26-year-old. “I don’t know exactly but probably it will not be the most friendly,” he told reporters at a press conference. “People in Southampton were always really nice with (Nathaniel) Clyne, Adam Lallana they obviously missed most. Dejan Lovren and Sadio Mane they were okay, I’m not 100 per cent sure anymore. “Virgil is the last one. I really understand that but it’s not something that we really think about. It will be more normal in the future, now we have to go there and play football and nothing else. “I don’t think anyone in Southampton says we’ve stolen him or something, it was quite a very public deal so. Klopp also complimented the Southampton club for the work they do in nurturing players who have since gone on to join Liverpool. “Ox (Alex Oxlade-Chamberlain) is from there as well, even though he went a different way. Liverpool are currently third in the Premier League table, while Southampton are in 15th place, and just two points above the relegation zone. Email “Southampton reception for Van Dijk 'will not be the most friendly,' suspects Klopp”. Feedback on “Southampton reception for Van Dijk 'will not be the most friendly,' suspects Klopp”.